Jason Paul Behrendorff is an Australian born cricketer who plays for the Australian Cricket Team. He is a fast bowler and also plays for Western Australia at the domestic level. In the BBL, Jason Plays for Perth Scorchers, while in the Indian Premier League he currently plays for the Mumbai Indians. Jason was born on 20th April 1990, in Camden, New South Wales, Australia. He grew up in Canberra and played for the Australian Capital Territory at both junior and senior levels. He is primarily a left arm fast bowler and bats right-handed. His tall stature of nearly six and a half feet makes him extremely dangerous and difficult to face. 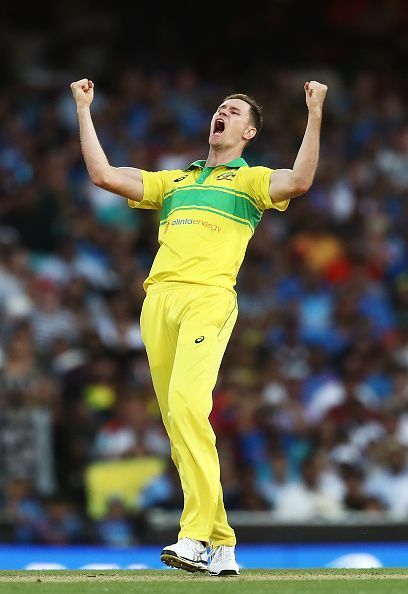 Jason Behrendorff started his International career for Australia on 7 October 2017 when he featured in a T20I game against India. He was given the cap number 88 in T20s for Australia. Jason debuted in ODI cricket for Australia on 12 January 2019 vs India. He was capped at ODI cap number 227. Jason Behrendorff was transferred to Western Australia from Australian Capital Territory for the 2010-11 season and he made his state-level debut in the season that followed. In the BBL, he made his debut for the Perth Scorchers in the 2012-13 season and was an integral part of the team when it won two consecutive titles in the 2013-14 and 2014-15 season. He was bought by the Mumbai Indians at the 2018 IPL auction and currently plays for the Mumbai based franchise in the Indian Premier League. Jason Behrendorff was listed in the 15-man squad for Australia for the 2019 ICC CRICKET WORLD CUP. His recruitment over Josh Hazlewood came as a surprise to many. But considering his current form and performances in recent ODIs against Pakistan surely made him a better bet than Josh who has been struggling with injuries. BBL 2018-19: Adelaide struck by Scorching heat at Perth.